I went to bed the other night thinking more about all the things that have happened with Hope. I thought I’d put a few of them in writing in this blog, most of them have been written in her journal already, but it’s fun to look back at all the things that had to happen for her to be part of our lives. For Hope to have come to the U of I Hospitals, was in itself amazing. Her parents were from the South. They came to Cedar Rapids, Iowa, to deliver her. I, to this day, do not know why. The pre-adoptive parents were from the east coast so why did her biological parents not go to the east coast? A few weeks before she was due, the pre-adoptive parents asked for another ultrasound to be done. Had they not asked for another ultrasound, Hope would have delivered in Cedar Rapids. She would have gone to live with her pre-adoptive parents. They did the ultrasound and found her heart defect. The pre-adoptive parents said they would not proceed with her adoption. I remember Dan saying it was ironic because where the pre-adoptive parents came from was one of the best hospitals that did HLHS repair. Hope was brought to the University of Iowa Hospital for delivery. Dan heard the story and is moved by it. The biological mother has decided she will deliver but will abandon the baby and refuses to do the surgery. The surgery is risky, odds are 50/50 at this time and for that reason the hospital is not required to do the surgery. The options presented to parents when their baby is born with HLHS are: 1) to not treat, 2) the three-step repair surgery, or 3) a heart transplant. Dan cannot stand for Hope to be alone at the hospital and to die without a family so he decided to talk to me about bringing her home. We’ve been through Kyle’s death. We knew what to expect. We figured we could handle this and this little girl deserves a family who loves her. No one should be alone when they die. For Dan to have been in the unit was a miracle in itself. Codey had to have his shunt repaired earlier in the month. Your rotations are for a month when you are doing your fellowship. You are either in the unit or you are doing research. Dan would not have been in the unit, had he not had to make up for missing a couple days because of Codey’s surgery. Since Dan would not have been in the unit, he would not have heard about Hope. He did hear her story, fell in love and he talked to me. He refused to let me see the baby until I had time to pray and contemplate . Dan knows how much I love babies and once I saw her I would not be making a decision based on facts or what God is saying or what was best for our family. We decided to talk to the kids to get their opinions. Zach,who was 10, felt that no baby should die alone and without a name. Cassie, who is 6, had always wanted a baby sister. She is ecstatic about the prospect of having a sister. She got on her knees and begged for this sister, who may only live a couple of weeks, but Kyle was her brother and she doesn’t even know him, but someday she will be with him forever, so this little girl will be her sister forever too, even if she only lives a couple of days, and really she has always wanted a sister so plllleeeeaaaassseeeee can we have her? (If you know Cassie, you know that is exactly how she talks when excited. It’s one big, long run-on sentence. I don’t have a clue where she gets it from. lol) I was blown away by my kids reactions. Dan talked to social worker, nurses, and physicians many of whom think we may have lost our minds and weren’t afraid to give Dan their opinion. He put everything into motion. Because Hope was so sick they talked directly to the mother to get permission for us to take Hope home. Her biological mom seems relieved that we want her baby. We started making plans to take Hope home. After praying about Hope, asking God whether this will be too hard on our kids, deciding that we can do this, and setting things in motion, the cardiac surgeon comes up to us and says that he will do everything in his power to get her through surgery if we want to try. We take this as a sign from God and we decide if we’ve come this far, we should at least give her a chance at life. We decide to proceed with the surgery and adoption. We talk to the social worker again. We find a lawyer. I can’t even remember how. We file the papers. Time is of the essence because once they stop the prostaglandin, Hope’s PDA will close and she will start to die. A judge rules that the 6 month waiting period can be waived so that we can get her on our insurance. We have a quick home study. Everything is proceeding which, having gone through what we have gone through with Benjamin & Maisey’s adoption, is a miracle in itself. We found out it will cost close to $10,000 to adopt her. We obviously don’t have $10,000. We were barely able to scrap by on what Dan made working at the hospital. Fellows are paid better than residents but it’s still not a lot. We had $120,000 in school loans, a car that barely worked and had to pay $1,200 for a 3 bedroom house – gotta love those college towns. We started to pray for help knowing if this is truly what God wanted, He would provide. We got a credit card offer in the mail, we took this as a sign and applied for it, believing the whole time that no one would be crazy enough to give us that much credit. They gave us a $10,000 limit. Who gives a $10,000 limit to poor people with huge debt? We paid for Hope with a credit card and on June 29, 1999, she legally became our daughter. Hope’s first surgery, when she was 3 weeks old, was complicated. She came out of surgery with her chest still open, a thin, transparent sheet covering it. What an amazing sight, to see your daughter’s heart beating in her chest. It was completely and utterly unbelievable and amazing, but just take my word for it – no need to see for yourself. Her heart rate went through the roof. The doctors can’t get it below 200. They told us that she can’t last for long like this. They wanted to try an experimental drug. Dan says okay but he is going to do some more research on it and headed to the library. We prayed and prayed and prayed. They gave the medicine and nothing happened. They can’t figure out why. They gave the medicine again and nothing happened. Dan came back after hitting the computers and said he didn’t want her to get the medicine, it’s experimental and he thinks there may be other alternatives to try. The nurse said they’ve already given two doses and nothing has changed. They can’t figure out what has happened. The nurse comes in later to change Hope’s tubing, feels Hope’s bed, it is all wet. The medicine has drained out onto her bed. Hope never got the medicine. I remember the nurse’s face when she was telling Dan that something was wrong with the hub and Hope didn’t get the medicine. In the meantime, there is an alternative found, they tried it and her heart rate came down. There were great risks involved with the experimental medicine and somehow Hope did not get the medicine. I don’t know why it happened, but I love that it happened. I remember being so sad and just wanted to know that it would be okay. I had been through this before with Codey. He didn’t even leave the hospital until he was 14 months old and then it was only for a few days. He was so sick and for so long. I don’t know how many times we have heard that he was going to die. How many times we called family for them to come down because this would be his last day. He was on a vent for years, trached until he was 5. Dan and I cared for him at home. We had nurses for a while, but that lasted only a year or so because of different things that happened. I think about that a lot. Who lets parents with no medical experience take home a child home who is that sick? With Codey, we were asked time and time again if we wanted to withdraw support. How can you withdraw support on a child who is lying there playing and kicking and smiling? I remember thinking all the time about Kyle being on a ventilator. He died with every possible thing being done for him. I knew that if God wanted to take Codey, He would take him home. I didn’t want that to be my responsibility. I didn’t want to make that decision. I didn’t want to question whether what I did was right or wrong forever. I knew what that decision was like for parents because there was a boy in the unit that had been sick for a long time and those parents withdrew support. I pray for that mother to this day and I think about that little boy all the time. Dan even had his name engraved inside a ring – their story touched us that much. I know that everything is on God’s time. They told us Codey probably wouldn’t live past a year and he will turn 25 this year. Only God knows the number of days any of us have. Anyway, back to Hope, I remember sitting in my friend’s driveway with Zach and Cassie. I was praying for Hope again, she was just a few days old. Talking to them about what was going on. I joked that I just wished God could tell me that it was going to be okay. If I could just have that confirmation, I could go through anything. We all laughed and I got ready to back out of the drive. As I started the car, the radio came on and played “everything’s going to be all right, rock-a-bye“. We all just stared at each other. I know people talk about coincidences, I prefer to call them Godcidences. Hope had her 2nd surgery when she was 8 months old. She was supposed to be in surgery from 8 a.m. to 2 p.m. She ended up getting out of surgery at 6:15 p.m. They ended up keeping her in circulatory arrest for much longer than was recommended, over an hour. They had a hard time getting through all the scar tissue, there was a lot of bleeding, and other issues that arose. It was a very scary time. They kept her paralyzed for quite a while after surgery because they were worried about seizures. Dr. Chris stayed by her bedside. She came through it all fine. What a fighter she was, which leads us years later to the next story. When Hope was 4, we were driving down the road and she proceeded to tell us a story about dancing with a boy named Kyle. We thought she was talking about a boy from home school tumbling who was one of her teachers. She said, “No mommy! My brother Kyle”. She told Zach, Cassie and I a beautiful story about when she was a baby and was lying on a table, and Kyle came to dance with her. Kyle told her that everything was going to be okay and to not be afraid. I tried to remember then if we had even talked to her about Kyle. If you ask her today, she will tell you that she doesn’t remember the story. If you ask Zach, Cassie & I, we can recall it vividly. What a day that was. I realize there is no proof that this can happen, but she was arrested for over an hour and who knows? As a mother, I like the thought that Kyle was there for her. When Hope is 3, her heart surgeon is going to move to Canada. He doesn’t want anyone else doing Hope’s surgery because he knows what he did to start with and what he’ll see when he opens her up. He asks us if we are willing to do it early so he can finish what he has started. God is in all things because he did not let Dr. Chris forget her. We’ve had many doctors move. It’s not uncommon in a teaching hospital. The most we ever got when they moved, was a letter in the mail. I love that God kept her on Dr. Chris’ heart. She did remarkably well. We go to the U for all Hope’s medical care. She had to have heart catherizations from time to time. Her cardiologist was moving and we were to meet her new doctor. Dr. D. We were nervous because we had had the same cardiologist for a long time. Dr. D heard Hope’s story from her previous cardiologist and decides to take Hope’s information with him to a nationwide cardiology conference where he presented her information. This is all before he has even had an appointment with us. He presented her case (a broken stent in her left pulmonary artery) to his colleagues and they decided what course of action he should take. She got the very best advice from the very best cardiologists across the nation. Why would he do that for a patient he had yet to even meet? We discuss Benjamin’s case with this same doctor. He tells us while he was in New York he worked on a couple of cases like this. He says it’s an unusual case because most of these kids, who are born in the US, get it fixed right away and are completely healed. He has, however, worked on a couple of kids who were adopted with the same defect as Benjamin. He says he won’t be able to fix Benji, but he can buy him some time, maybe even 10 years. We have the utmost respect and trust for this doctor. How a doctor from New York ends up in Iowa, and has worked on cases like Benjamin’s, I don’t know, but I thank God every day that Dr. D is here. These are just a few of the things that have happened in Hope’s short little life. God is at work in the big and the little things. Trust in His plan. Trust that all things work together for good….not that all things are good. I am honored that He would see fit for me to see these things while I am still on this earth. I can’t imagine how many more will become clear to me when I hit heaven’s gates. I’m sure I will hit my knees thanking Him for coming to my rescue and praising Him for all the things my finite mind couldn’t even comprehend or missed completely and didn’t see while I was living. I am truly blown away at the many blessings I have received and the things that have worked out for the best when I thought it wasn’t even possible. We heard the song by Sidewalk Prophets called “You Can Have Me” yesterday and Gracie started singing. She stopped to ask me, “Does that mean to leave everything and follow Jesus?” I said, “Yes!” and she went back to singing with the song. I must say there is nothing better than hearing a 6 year old belt out a song from 107.1. When the song was over I asked her, “What would you do if Jesus asked you to follow him?” She asked, “Would that mean I had to leave my family and everything?” I said, “Yes! Benjamin, Maisey, all of us.” She said, “Well, of course, I would follow Him if He asked me to. I have all of eternity to be with my family.” The faith of a child is an amazing thing. I would like to think I would say that, but I’m not 100% certain and I don’t like that at all. Today in church Pastor talked about taking up the cross. Luke 9:23 Then he said to them all: “Whoever wants to be my disciple must deny themselves and take up their cross daily and follow me. I have been pondering this a lot lately. I do a few things right, but I do so many things wrong. So many of the choices I make are made by the world’s standards. I’ve dealt with these conflicting thoughts a lot. Forgiveness. People who have hurt me – I have forgiven. That one is easy to understand. Christ forgave me for my sins – who would I be to not forgive others. Before you say, some things are easier to forgive than others, believe me I’ve had horrible things happen. I get that! It’s taken me years to talk about being molested as a child. I somehow thought that the act reflected poorly on me. No one talked about it as I was growing up and I felt shame. It wasn’t until Cassie was 10 (the same age I was when it happened) that I was able to say, “I was just a child!” and forgive myself. The light bulb moment in my healing was when I realized that sin is sin and just as Christ died for my sins, Christ died for his sins. I forgave and I healed. It didn’t make it right, but I was able to turn it over to God and let it go. God’s grace. I can understand that one. I try to implement it. I often tell the story of running into a lady with my cart at Wal-mart right after Kyle died. She was so angry with me. I said I was sorry and sat there and cried. She must have thought I was crazy. I didn’t even see her. I was so caught up in my grief and my thoughts. I think of that often when someone cuts me off in traffic. Are they on their way to the hospital? Are they grieving? Did they even see me? Some days it’s easier to do than others, but I try. God’s grace is giving us what we don’t deserve. During this time of lent, do that for others. Give up what you want for Christ, but also honor Him by giving what He has given you – grace and forgiveness. Faith & trust. Believe me. God has tested me on this one over and over again. I can honestly say I’ve pretty much got it now. That’s not to say I don’t get nervous or worry, but it doesn’t last. Codey was still in the hospital when I found out I was pregnant with Zach and it was not planned. God knew what He was doing, but I was so fearful. I miscarried right before Cassie – that was hard to handle because I had sworn I’d never get pregnant again. That’s a lot coming from a girl who once believed she wanted 12 kids. Then came Cassie and being monitored the whole pregnancy. Hope’s story – full of trust & faith. Then Gracie, felt it to my core that God was telling me to have another child, fertility doctor said he could do the tubal reversal but the odds of getting pregnant were slim – something like less than 20%. I was 40, tubes had been tied 12 years, but I had the utmost faith if God was truly wanting me to get pregnant, then I would. The very first month I was blessed with Grace. I have never been so full of trust and faith in a loving God then I was while I was pregnant with her. Then came her emergency delivery, I had a vessel rupture and they just happened to catch it at a routine ultrasound. God was in control. I’ve been asked numerous times why I’m not upset – like when they said they were sending me for a bone marrow biopsy for Grace. The doctor took me into the hall to ask me if I understood what he was saying? He was worried because I hadn’t fallen apart. How can you not have faith and trust in a God that has showed himself to you so many times? God’s plan is perfect. God’s timing is perfect. God is holy and God is love. God loved Gracie before me. His plan for her is perfect. But taking up the cross and following Jesus, what does that really mean? Does that mean giving up all worldly things. Is any t.v. ok? How much money is okay to spend on frivolous things? How much is enough to give? I know I can do more, but what is enough? Does any of us know? These are the thoughts I’m pondering. I know I do so much less than many and a little more than some, but God is placing this on my heart more and more. In the immediate future He is leading me to China, but I anxiously await where He leads me next. Praying that I too can have the faith of a child. Working on the kids room and it is so cute. Well, cute if you’re 2 & 4. 🙂 I hope they like it. In the middle of going through old boxes, I found a box of old bills from when Codey was in the hospital. Wow! They start in 1987. You should see the bill printed for 4/30/87 to 1/13/88. I don’t even want to know how much paper was wasted printing off his bills. I decided to shred them. I’m not even sure why I have them still. In the midst of all the bills was a letter from Methodist about me not paying my bill. The boys were covered the minute they were born, but because they were 3 months early my delivery wasn’t covered. 1 more month and it all would have been covered, but because I was early Life flight and the delivery weren’t covered. I remember getting the letter because I cried so hard and then I just sat on the floor and laughed. It was for $4,500 & they told me they had given me ample time to pay for it because they had waited 4 months. There was also a letter stating that we couldn’t hold the bill paying $5 a month. How hilarious is that? How long would that have taken to pay off at $5/month. They told us we could apply for financial aid if we thought we qualified. We had both quit our jobs and we were living in the Ronald McDonald house trying to figure out what to do with our lives. Needless, to say with no income, we qualified for help. I thank God for insurance and for financial aid. So many memories came flooding back as I was going through his bills. Having to leave Codey, who was so sick, and drive Kyle to the funeral home. We couldn’t afford for them to come pick him up so we drove him up to Fort Dodge. My mom & Linda with me, sitting there pathetically, holding the shell of my little boy – wishing I could do anything to change it. The chaplain told me that I should take him and that I wouldn’t regret it and she was right. I remember having to hand him over to the funeral home director. Having to pick out a little, white casket. I was so afraid Codey would die while we were gone. That was such a hard decision – do you stay with your son who is so ill and might die or do you drive 90 minutes away and bury your son? I don’t know why I’m writing about it. Maybe because the memory is so fresh and I don’t think I’ve ever put these words in writing. I journal for the kids, but I don’t often do it for myself. I don’t remember much about the funeral, except Dan. I remember him walking to the back of the hearse and picking up the casket and carrying it to the gravesite. Dan had never been to a funeral before and had never heard of pall bearers. I carried Kyle to the funeral home and Dan carried him to the grave. I suppose it was fitting. Linda recently found a typed up paper of what Dan read at the funeral. I remember thinking how brave he was standing there and talking about Kyle. I won’t type the whole thing because it’s pretty long and it just restates what was going on with the boys and me. I had gotten pretty sick after the delivery and he had all 3 of us to worry about. Here’s what he said…The Lord has a plan for each of our lives. These plans all come together to form one big overall plan. These plans are all interrelated and interconnected so that a change in one results in a change in all. As short as little Kyle’s life was, he was alive for a reason; actually, for very many reasons. He was here to show us not to give up no matter how bad things are or how many things we have going against us. He was here to show us how much love we have to give. He gave my life a purpose and when his little brother is old enough to understand it will give purpose and meaning to his life too. His death showed us not to waste a moment of life, but to cherish it for the precious thing it is. It will affect everyone in some way, but there’s one thing I want to make clear. He was here to make our lives better not worse. If you let his death affect you in a negative way, then his life will have been wasted. The Lord is watching over him now, and when the Lord call us home we will have our baby boy there to greet us. His life can be best summed up by Job 1:21 and said, Naked came I out of my mother’s womb and naked shall I return thither; the Lord gave, and the Lord hath taken away; blessed be the name of the Lord. I just want to go already…. I was talking to a friend of mine yesterday about going to China. They have a little girl (who is as cute as can be) that they adopted from China. Every time I see her I just want to squeeze her. 🙂 We were discussing how sad and scared her daughter was at the very beginning. My friend said the very next day when they gave their daughter a second bottle it was a turning point. She was amazed that there was more food. That just breaks my heart, especially because Benjamin hasn’t grown in the past year. Maisey is 2 and he is almost 4 and there is only 1 pound difference. Kids with heart defects need extra calories just to grow. 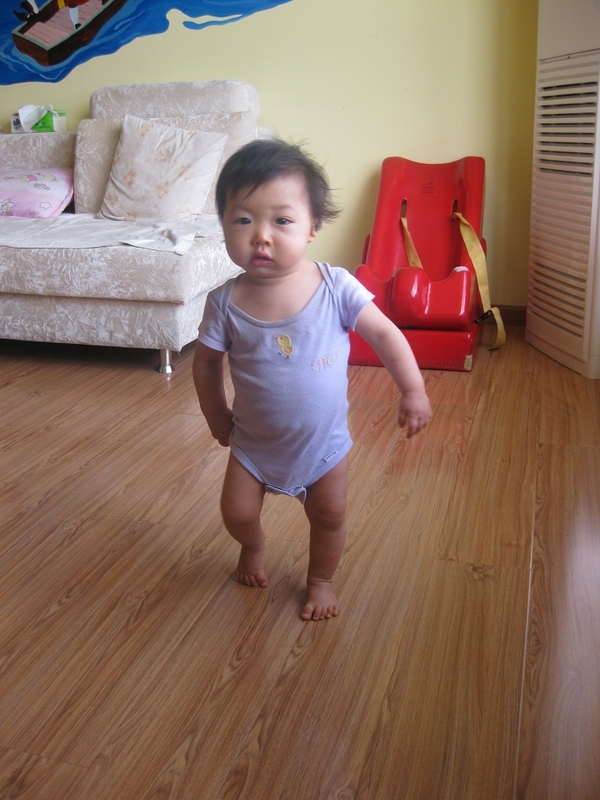 I think about him there in the orphanage needing and wanting more food and it just makes me want to cry. I hate that my children have had to fend for themselves. I’m happy that there was a place for them to go. I’m happy that people have cared for them, but I hate that this world is so imperfect. I hate that they were abandoned. It truly breaks my heart. On a different note, I took a bunch of stuff to Goodwill today. Did my spring cleaning early because I’m afraid my spring is going to be very busy. We have stuff in boxes that we carted from Iowa City 10 years ago. As I was looking at the stuff, I kept asking myself why have you held on to this? Now was a wonderful time to just go through everything. My motivation? Watching my mother-in-law go through her father’s house full of 90+ years of papers. She found papers from the 1920’s. I don’t want to do that to my children. Although, the papers were kind of cool to look at. As I was dropping off my stuff at Goodwill, I was thinking about all the useless, unnecessary stuff I buy. The gentlemen at the door was talking to Grace about the clothes that were being packed up and how they send some of them overseas to people who don’t have anything. Gracie was very touched by that. Grace & I discussed how it’s hard when you see something pretty and you would like to have it, but you don’t really need it. We should just walk away and see if we even remember it in a week. How much better would it be to give that amount to someone else? I have done so many things wrong with my money. It makes me want to be better. Which led me back to Maisey & Benjamin, I’m so happy they will soon be part of my family. I’m also sad that there are so many hurting kids out there without a family. I may not be able to adopt any more, because the legal system frowns at adopting over 50 – which I suppose makes sense. I can, however, sponsor some orphans. I may get up to that 12 child mark that I once talked about in high school. Sounds like a good goal to me. I sat in church today and was reminded that God is everywhere. I know this. Truly I do. He is in the big things and the little things. He knows my thoughts and the number of hairs on my head. I have seen Him work in so many things during my life. I have been driven to my knees, at my child’s bedside, begging for “Jesus, Come to My Rescue” (yes, the song lyrics) and seen Him work miracles. I am constantly blown away by this. I know that He and only He knows the number of days we have each been allotted. I know that His plan is perfect, as is His timing. But today the reminder that He truly is every where was just what I needed to hear. It brought tears to my eyes. God is not a Father who only disciplines. He is not an angry judge waiting for you to mess up. He is a Father that can work all things for good. All things. That is absolutely, positively mind blowing. So today whenever my nervousness or fear raises it’s ugly head, I will hear Pastor’s voice reminding me that God is in control. That He knows all and would not have placed these children on my heart if it was not meant to be. I pray that I can be the mother that Benjamin & Maisey need. I pray that the moment they see Dan & I they can feel all the love we have felt for a year now. I pray that they will be at peace and know that they are loved. The truth of the matter is I do want to be here for Gracie and it is only one more week. An extra 7 more days. 168 more hours. Though it’s depressing that I won’t be back for Gracie’s birthday on March 23rd. It’s her 7th birthday and she is so excited. What a great gift that would have been….well, I guess will be. We’ll only be a couple days late. Then our family will be together – well, almost everyone will be here. That is a whole other story for another time.